The Startup Code initializes the microcontroller and has to match the configuration of the hardware design. Typically, the startup code resides in a file named startup_device_family.s. Some devices might also use a file named system_device_family.c. Startup files should be copied to the project folder. 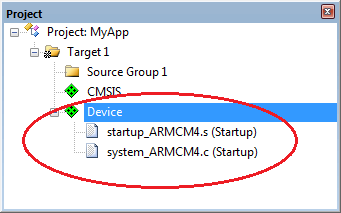 For devices supported by Software Packs, the startup files are located in the group Device. Though the default settings are a good starting point, adaptation might be needed. 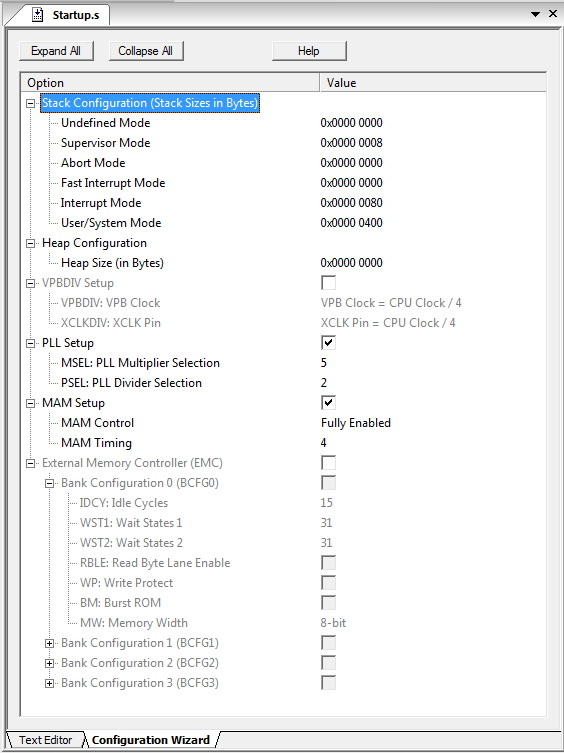 For example, the CPU/PLL clock and the BUS system are target specific and cannot be configured automatically. Open the file in the editor. Most startup files include special comments for the Configuration Wizard providing GUI-like controls to set values. The tab Text Editor switches to the standard editor view.